Area rug cleaning is one our favorite services. Area rugs and Oriental rugs are a beautiful and, when properly cared for, a long lasting addition to any home. Like well-placed wall decor or fine paintings, they contribute to the overall character and complete the furnishing of a well-decorated room. We often refer to rugs as the art we walk on. Unlike wall decor, area rugs usually receive a fair amount of traffic. Rugs like this are often put down in high-traffic areas to decorate, liven up and even protect these living spaces. Area rugs need regular cleaning by well-trained professionals. Similar to carpets and upholstered furniture, area rugs act as air filters for the home, trapping dirt, allergens and bacteria and preventing those unhealthy elements from circulating to other rooms. Area rugs are only able to do this properly if they are maintained and kept clean. Just as an air filter for your home ventilation system needs to be regularly replaced, your carpets, upholstery, and area rugs need to be regularly cleaned. The professionals at Chem-Dry Northeast want you to have a clean, healthy home. We provide high quality area rug cleaning services, focusing on care and attention to detail, that restore the rugs to their original beauty while removing dirt and allergens. Oriental rugs in particular require a detail-oriented rug cleaning process and well-trained technicians to care for them safely. Every of these hand-made works of art are unique and require specialized attention to deep clean them. IMPORTANT: It is not possible for us to properly wash area rugs in your home. 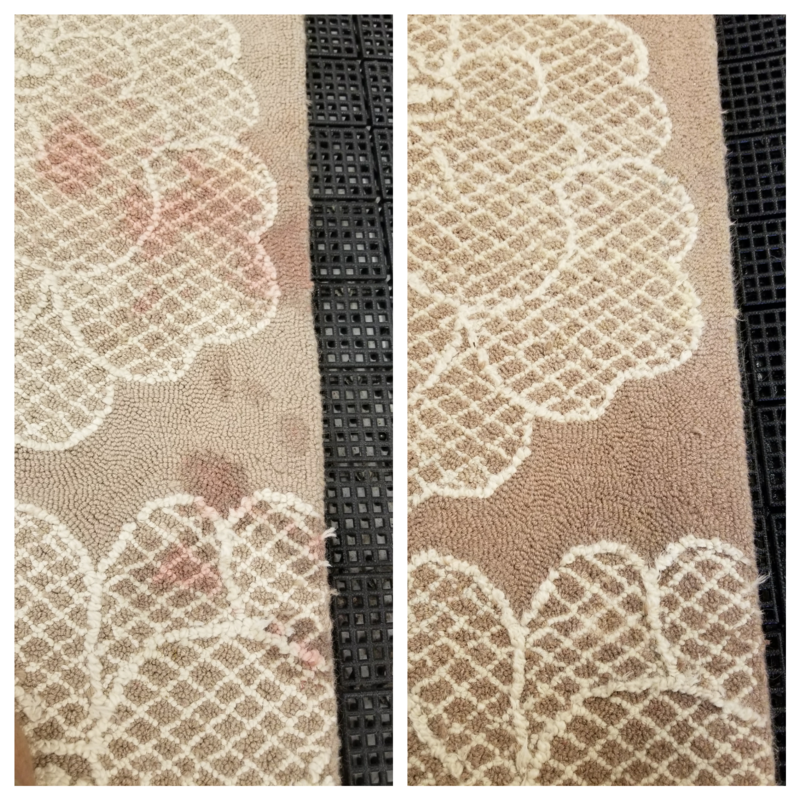 Thorough cleaning requires special equipment to remove dry soils (known as rug dusting), dye stability testing, washing of both sides and all the way through the rug, fringe cleaning, proper drying conditions and more. Chem-Dry Northeast professionals are trained to clean all types of rugs, from common area rugs to expensive and delicate Oriental or Persian rugs. While each rug will be evaluated and treated individually, here is generally what you can expect when you have us care for your rug. First we do a thorough pre-inspection before any cleaning begins. Our technician will look at the construction of the rug and overall condition. Also, we’ll look for any damage like rips/tears, signs of dry rot, dye bleed and more. We do our best to discover and document these things during the rug pick-up, but a more thorough inspection will occur once we get it back to our shop. Our technician will inform you of any unusual findings before cleaning begins. At the shop, we also do a thorough dye-stability test to make sure the dyes are likely to stay put during the washing. There are many factors that can make dyes unstable such as pet urine damage, previous improper cleanings, etc. We do our best to identify these risks. 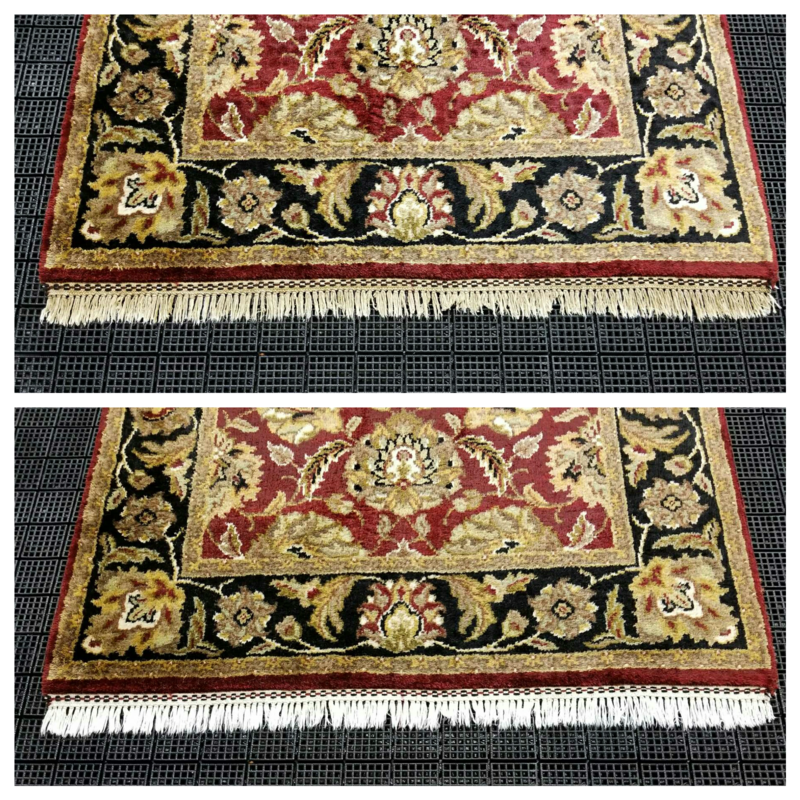 If the dyes to appear likely to run, there are options to stabilize them and safely clean your rug. Next, after inspection and dye tests, we move on to dry soil removal. In the rug washing world, this is referred to as dusting the rug. Vacuuming can only remove so much. The remaining piles of dust, debris, sand and grit from deep in your rug with our specialized dusting machine. As we maneuver the machine over the back of the rug, it gently vibrates the rug and the debris is able to fall out of the rug. For very fragile rugs we may elect to blow the dust out with an air dusting machine. This dusting process is crucial for thorough soil removal. Wool fibers in particular have a “fish scale” type texture which can trap and hold large amounts of soil. 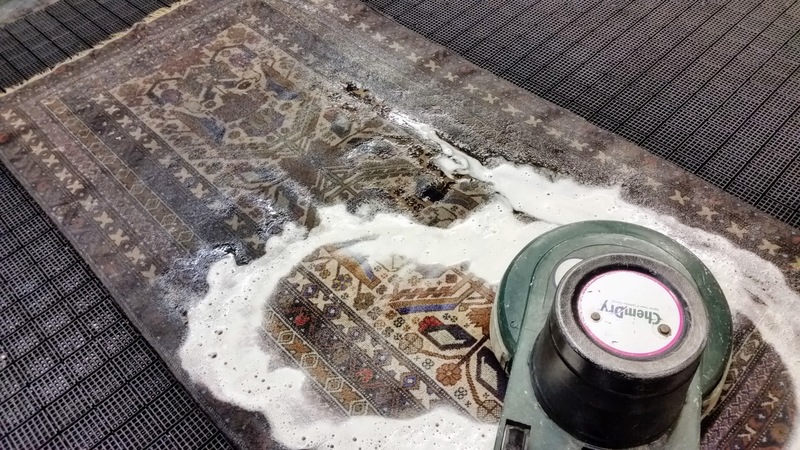 Gently washing oriental rugs is one our favorite services we offer. Now onto the washing! Chem-Dry Northeast uses wool-safe certified shampoos and gently agitate deep them into the rug using soft brushes. We flip the rug and do the same to the back side of your rug as well before thoroughly rinsing out all the soaps and soils. Depending on the level of soiling, this rug cleaning step may repeat several times to ensure all soil is removed. If any specialty stain treatments are necessary, we usually also do that at this point and then detail clean the fringes. Finally, the rug is groomed so the face fibers lay correctly before we start drying the rug. Once the nap is set, your rug will be hung on our drying rack or laid flat. High powered air movers help evaporate the moisture quickly. After a final inspection to make sure everything is just right, we’ll arrange to deliver your fresh, clean rug. This may be our favorite part of the process! Fringes often need special attention to restore them to their appearance. Our effective, yet gentle rug cleaning process preserves the dye within the fibers of your rug, leaving the colors in your rug vibrant and fresh. We also have optional treatments such as moth-proofing, stainguard protection and even pet urine odor removal that are available at an additional charge. Other things to know: Pick-up and delivery of your rug is included at no charge. We generally have a turn-around time of 7-10 days between picking up the rug, cleaning it and delivering it back to you. Chem-Dry Northeast is fully insured and bonded. Call or email and talk to us about your rug. 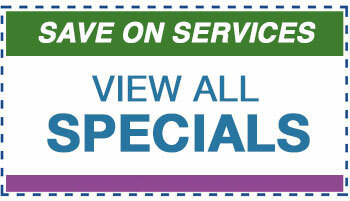 We love to hear about rugs and would be happy to provide you a price quote for washing your favorite rugs. Estimates are always free whether on site or over the phone. Appointments are available Monday - Saturday, generally between 9:00am and 5:00pm.